Here are some earrings that are a little different, that I tried as an experiment. Instead of simply attaching a bowl-shaped piece onto a square shape and calling it a day, I decided to connect them together with wire and thread charms and chains to each end. I felt it would add more visual interest and give it much more movement. I started out by creating square shapes in polymer clay and coating them with gold metallic powder. The bowl shapes were sculpted in translucent polymer clay and dusted with yellow-green metallic powder. A wire runs through both pieces. 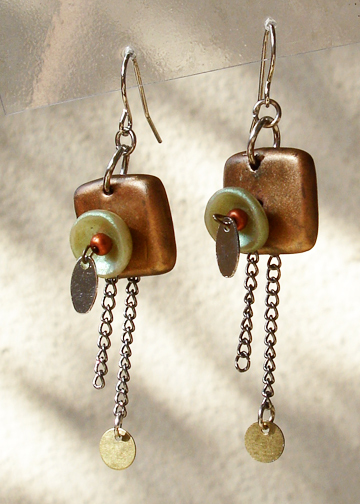 At the back of each earring is a single copper bead to anchor it, with a chain and circular charm hung between the copper bead and the back of the square piece. In between the square and bowl shape is another shorter piece of fine chain. To anchor the front of the wire inside the bowl shape is another copper bead. I decided to loop the end of the wire so I could dangle a tiny silver charm at the front of the piece. 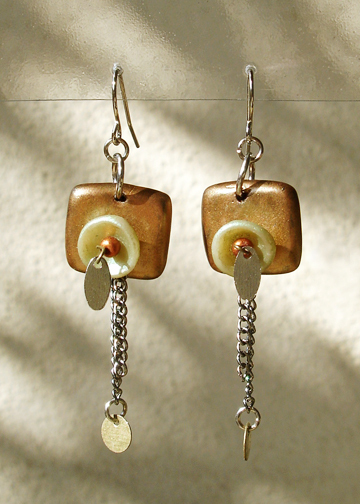 Here is another shot of the earrings at a slight angle that better shows the different layers. I’m pleased with the results and will most likely try other pieces using this basic idea. They would most definitely be a good conversation piece when one wears them!